This is a kid friendly meal. Healthy if you will skip the store bought seasoning mix, however a store bought sloppy joe mix can also be use. If you're thinking of doing a meatless meal once a week or started already..well kudos to you! Baby steps and moderation are the best tips I can give you if you want to establish healthy habits. 2 tbsp Homemade Sloppy joe seasoning mix or use store bought. Heat oil and saute onion for about 2 minutes. Bring to boil , reduce the heat to low. Cover the pot and let the rice cook for 20 minutes or until tender. Stir in your sloppy joe mix and 1/2 cup of cheese. Stir in Black beans. Cook until it is heated through or until the cheese melts. Sprinkle a little bit of cheese on top if desired. 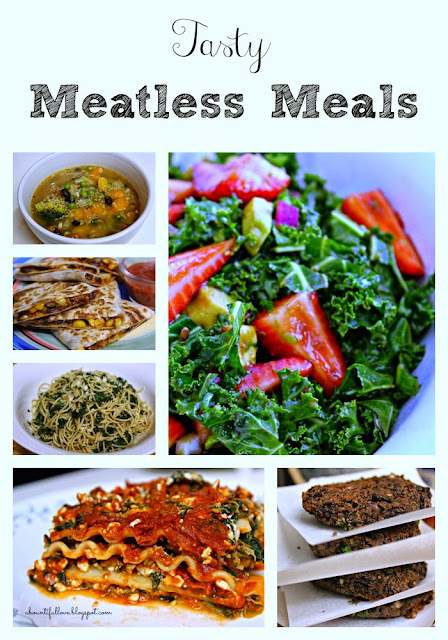 Looking for more meatless meals? See it HERE. This would be great for my youngest daughter that doesn't really like meat. Thanks for sharing. BTW- tried to follow you on twitter using your icon on your sidebar, but it says that the page doesn't exist. I think your link is broken. Hi Erlene..Thank you for stopping by and taking the time to leave me a message :) appreciate it! thanks for the heads up on the link :) I deleted my twitter account because it was hacked..completely forgot about the link. Thank you again! Hi Mel..its my pleasure! Thank you for always stopping by and taking the time to comment..it is greatly appreciated! God bless.. Thank you for visiting! You are welcome and it is my pleasure to link up..thank you for hosting! Things People Say Prior To Having Kids.